Fumaria indica is a medicinal plant of the fumitory family wildly growing throughout India. Classical texts of Ayurveda, i.e. the oldest traditionally known health care and medical system originating in Indian subcontinent, mentions diverse medicinal uses of the plant. During more recent decades broad spectrums of therapeutically interesting pharmacological properties of its extracts and secondary metabolites have also been reported. Recent observations made during efforts to define its pharmacological activity profile according to the Ayurvedic concepts of mind body medicine have revealed exceptionally broad spectrums of psychopharmacological activity profiles of diverse types of hydro alcoholic extracts of the plant. These effects of the extracts become apparent after their repeated daily doses only. Taken together with prior preclinical knowledge on the plant, these observations strongly suggest that Fumaria indica could be an easily available source for discovering and developing phyto-pharmaceuticals or drugs potentially useful for treatments of mental health problems commonly associated with numerous physical disorders and chronic diseases. 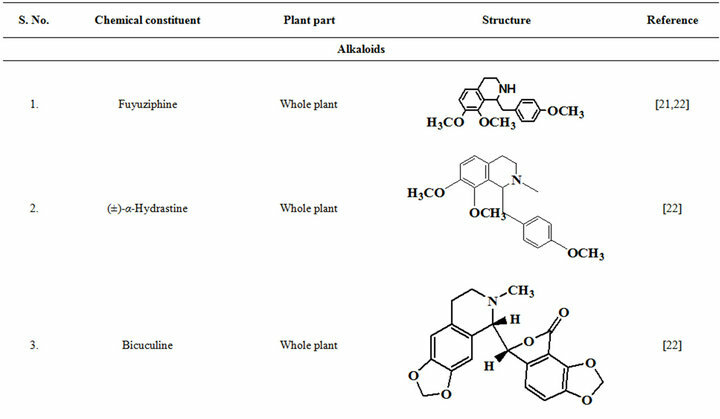 Since several psychoactive and other phytochemical of Fumaria indica are also encountered in other plants commonly used in Chinese and other traditionally known medical systems, observations made and the holistic strategy used for defining its psychopharmacological activity profile could be of interest of others involved in efforts necessary for proper understanding of therapeutic potentials of many plants containing Fumaria alkaloids and other bioactive phytochemicals present in Fumaria indica. Medicinal uses of herbs and their combinations are common characteristics of Chinese as well as Indian systems of medicines. Ayurveda, i.e. the oldest and still the most popular health care system of India, and traditional Chinese medicine (TCM) have always been widely practiced in many Asiatic countries, and during more recent they have also been well accepted and adapted in many other parts of the economically more developed world. Such global popularity of these traditionally known medical systems, especially those of TCM , has increased the global demand of traditionally known herbal remedies, and has also triggered interests of numerous modern medical researchers and practitioners in properly understanding their therapeutic potentials in terms of modern medical sciences. However, despite extensive efforts and considerable progress made during past few decades, many therapy relevant questions concerning medicinal phytochemistry and pharmacology of numerous Chinese and Ayurvedic medicinal plants cannot yet be properly answered in terms of postmodern concepts of evidence based medicine. Consequently, novel strategies and paradigms are now being conceived and tried in many laboratories for clarifying them. Hereupon, more attention is paid to the molecular mechanisms and pharmacological targets based concepts of modern medicine than to the holistic principles of traditionally known medical systems like TCM or Ayurveda. However, in numerous laboratories, especially in India, China and other Asiatic countries, the conventionally known more holistic strategies and in vivo animal models for evaluating therapy relevant pharmacological properties of herbs are still widely practiced. Phytochemical and pharmacological information now available on numerous traditionally known medicinal plants strongly suggest that most, if not all, of them could have modulating effects on the essential functions of the central nervous system (CNS). Although several such plants have been more thoroughly explored and commercialized in the western world for combating mental health problems , as yet little concentrated efforts have been made verify mental health benefits of numerous others well known as accumulators of diverse CNS-active alkaloids and other phytochemicals. Recent efforts in our laboratories to define neuro-psychopharmacological activity profiles of some Indian medicinal plants  led us identify diverse psychotherapeutic potentials of several traditionally known medicinal plants, including those of Fumaria indica and some other currently popular Ayurvedic medicinal plants. Fumaria indica is one such medicinal plant of the Fumitory species widely used in many other traditionally known medical systems commonly practiced in India and elsewhere. Several so called Fumitory alkaloids and other phytochemical encountered in Fumaria indica are structurally identical or similar to those of many other plants of the species, and several pharmacological properties of its extracts are also analogous or identical to those reported for extracts from other members of the family. However, potential roles of the psychoactive principles of Fumaria indica in therapeutically interesting pharmacological activity profiles of its diverse types of medicinally used extracts still remain speculative only. Efforts to clarify the situation is not only necessary for pharmacologically more rational standardization of its commercialized extracts, but also for identifying novel therapeutic leads potentially useful for combating comorbid mental health problems commonly encountered in chronically ill patients. In this communication our current understanding on medicinal phytochemistry of Fumaria indica will be summarized, and usefulness of more holistic psychopharmacological strategies for more precisely defining its therapeutically interesting pharmacological activity profile will be pointed out. Ayurveda is one of the three major traditionally known codified systems of medicine well integrated in the modern Indian health care system. Medicinal uses of many Ayurvedic plants, including those of Fumaria indica, are also known to practitioners of other traditionally known medical systems in India and elsewhere. Initially, Ayurvedic codes were in Sanskrit language. However, during more recent decades extensive efforts have been made to translate, de-codify, and understand its texts in English and other modern languages. It was only through such efforts that eventually Fumaria indica was identified as an Ayurvedic medicinal plant. Its medicinal values are often mentioned in classical texts like Charak Samhita , Dhanvantari Nighantu  and Bhava Prakash . Botanically it belongs to the Fumaria speciesalso commonly called “fumitory”, “earth smoke”, “beggary”, “fumus”, “fumittery” or “wax dolls” in English. These are annual weeds, growing wildly in plains and lower hills of India, Pakistan, Afghanistan, Turkey, Iran, Central Asia, North Dakota and Colorado [7,8]. The genus Fumaria (Fumariaceae/Papavaraceae) consists of many species , and the Fumaria species defined as Fumaria indica (Haussk) Pugsley (synonyms: F. parviflora, F. vaillantii), is now one of the most commonly used herbs in Ayurvedic, Unani and other folk medicine system of India. In Pakistan, it is traditionally used for treatment of dermatological diseases, topical diseases, cardio vascular complaints, circulatory disease, fever and headache . The plant is now commonly known as “Pitpapda” in India, and as “Shahtra papra” in Pakistan [11,12]. Its diverse currently known medicinal uses are often in agreement with, or justified by, its broad spectrum of therapeutically interesting pharmacological activity profile unraveled mainly during the 20th century [11,13]. However, many questions concerning the details of its botanical identity, chemical constituents, bioactivities, and more appropriate medicinal values still remain to be more properly answered in terms of modern sciences. It has recently been ascertained  that the genus Fumaria L. (Papaveraceae) consists of 60 species and that F. parviflora, F. indica, and F. vaillantii are closely associated species. Various vernacular names of the plant used in Indian system of medicine are given in Table 1 . The macroscopic, microscopic, and chemotaxonomic characteristics of the plant are useful tools for pharmaceutical industries for identification and authentication of its commercial samples. The HPTLC profile using rutin and protopine as marker have recently been proposed to be useful means for quality control and affirming batch to batch consistency of the plant material used by the herbal industries for manufacturing pharmaceutical products . It must be noted though, that both rutin and protopine are encountered also in numerous other plants, and that they are not the only extractable bioactive constituents of the plant. Table 1. The vernacular names of Fumaria indica. light green in color. Transverse sections of stem is quadrangular to pentagonal in shape, and consist of single layered epidermis covered with cuticle followed by two distinct layer of cortex containing closed and bicollateral vascular bundles at the ridges, without endodermis. Leaves of the Fumaria are compound, 5 to 7 cm long, divided into narrow segments. The lamina of leaf is made up of single layer, thin walled, rectangular to oval shaped, parenchymatous epidermis on either side; mesophyll composed of oval to polygonal thin walled parenchymatous cells; vascular bundle are scattered throughout the mesophyll; anomocytic stomata present on both the surfaces. Inflorescence has 10 to 15 flowered racemes. Flowers are 6 to 7 mm long, composed of two whitish sepals, four purplish green petals, corolla in 2 whorls, stamens 3 + 3 and 3 to 4 mm long bi-lipped stigma. Fruits are capsules, sub round to ovate, and are single seeded. The seed is spherical to ellipsoid and has an apical pore and rib [12,15-18]. Extensive efforts made during the latter half to the 20th century in several Indian and other laboratories have led to the identification and characterization of numerous phytochemicals from the leaves, stem, root and seed of the Fumaria indica. The very first report on isolation, structure elucidation, and pharmacology of protopine and a few other alkaloids isolated from Fumaria indica appeared during 1971 . Since then presence of numerous others alkaloids (often referred to as Fumitory alkaloids), flavonoids, glycosides, tannins, saponins, anthraquinones, steroids and triterpenoids in diverse parts of the plant have been reported [11,13,20]. 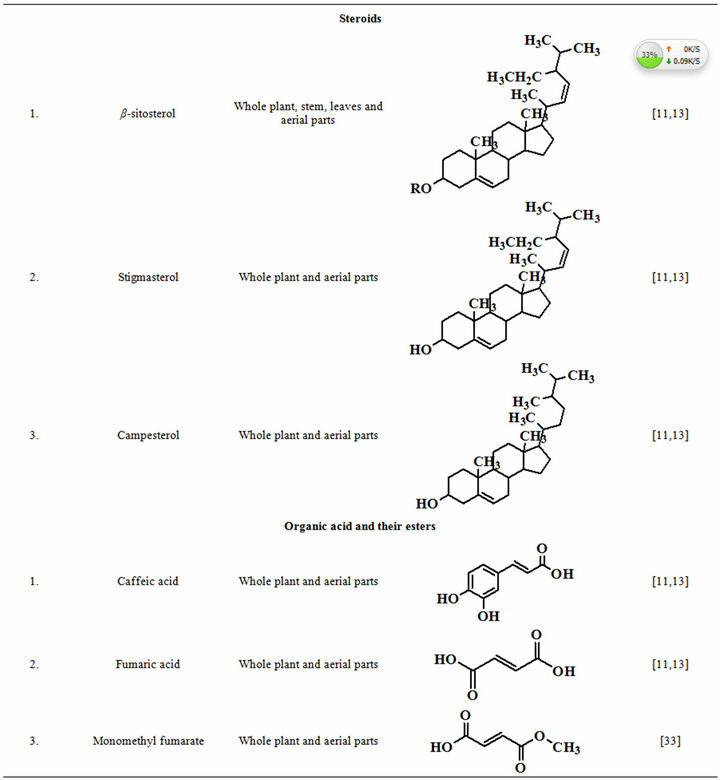 Structures of the phytochemical isolated from different parts of Fumaria indica are given in Table 2 [21-33]. Amongst them, a group of benzylisoquinoline alkaloids commonly known as “protopine alkaloids” are encountered in all parts of the plant. It must be noted though that depending on the acidic environments protopine alkaloids can exist in two isomeric forms , which theoretically must not possess the same biological activities. Such characteristics of these and other alkaloids are often neglected by modern medicinal chemists and pharmacologists. Moreover, quantitatively as well as qualitatively the alkaloid contents of Fumaria indica extracts depend not only on the extraction procedure used, but also on the harvesting period of the plant itself , possible influences of such variations, and of drying and extraction procedures, on the pharmaceutical quality of Fumaria indica extracts have not yet been carefully examined. In view of the recent report  that drying induced morphological changes do occur in Fumaria species, such characteristics of a plant can not necessarily be used for acquiring its authentic samples for medicinal purposes. More detailed phytochemical analysis might be a better alternative for medicinal purposes. For such purposes, a simple, fast and efficient method based on the use of GC-MS technique for proper chemotaxonomic identification of plants of Fumaria species  has recently been published. Table 2. 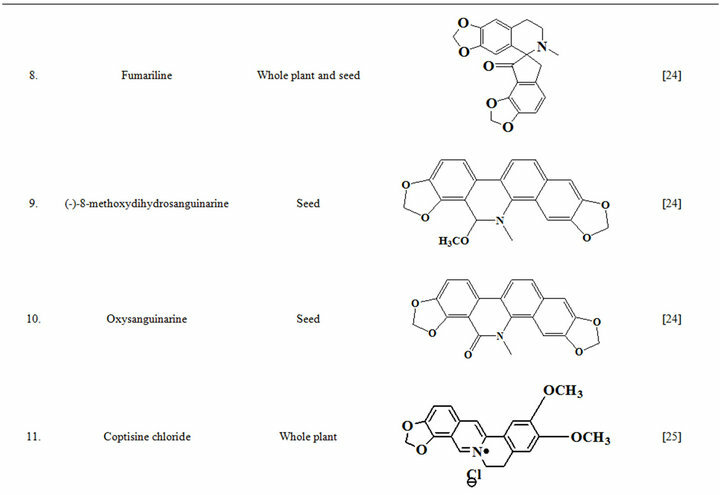 Structures of some bioactive phytochemicals of Fumaria indica. of abdominal cramps , diarrhea, fever , jaundice, leprosy and syphilis , blood disorders and tuberculosis . The leaf paste has been used to treat headache and fever , and decoction and infusion of the herb are indicated for treatments of goiter, leprosy, constipation, jaundiance, chronic fevers and dyspepsia . Fresh juice of the plant are administered orally for common fever, removing worms from the abdomen, blood purification and as liver tonic for hepatic ailment, and also used for the treatment of simple goitre, diabetes and bladder infection by taking its extraction early morning [43,44]. Whole plant of F. indica is an important ingredient of many common household, Ayurvedic, Unani medicinal preparations like Ayurveda capsule, Parpatadi-kwath, parpatadya arista, Parpatadi-arka, trifala shahtara, Sharabat-pittapapada [15,33], and other marketed polyherbal formulations such as Livokriti syrup, Esno capsule . 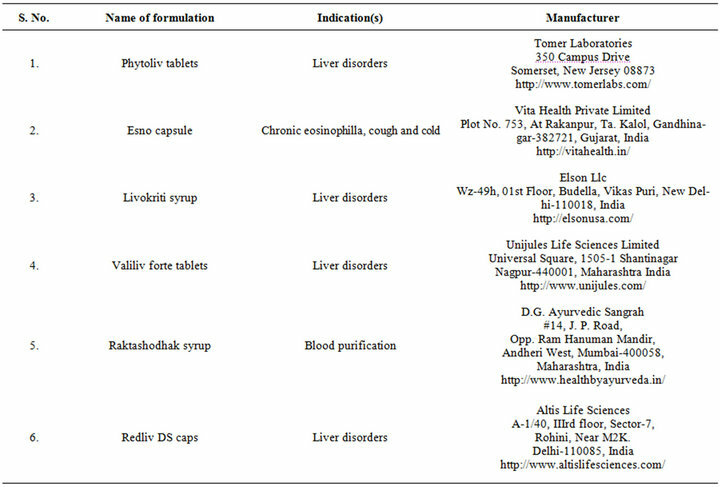 Examples of some such marketed formulations are given in Table 3. Furthermore, in Unani system of medicine, paste of fine powder of whole plant of Fumaria indica along with Azadirachta indica leaves, Swertia chirata, Sphaeranthus indicus flowers and Rosa damascene leaves in sufficient quantity of curd, has been used against pimples as routine home remedy . The very first reports on pharmacology of Fumaria indica concentrated mainly on the bioactivities of the alkaloids of the plant. Many of these alkaloids and other bioactive constituents of the plant are also encountered in other plants, and during more recent years the list of therapeutically interesting bioactivities constituents of Fumaria indica has enlarged considerably. 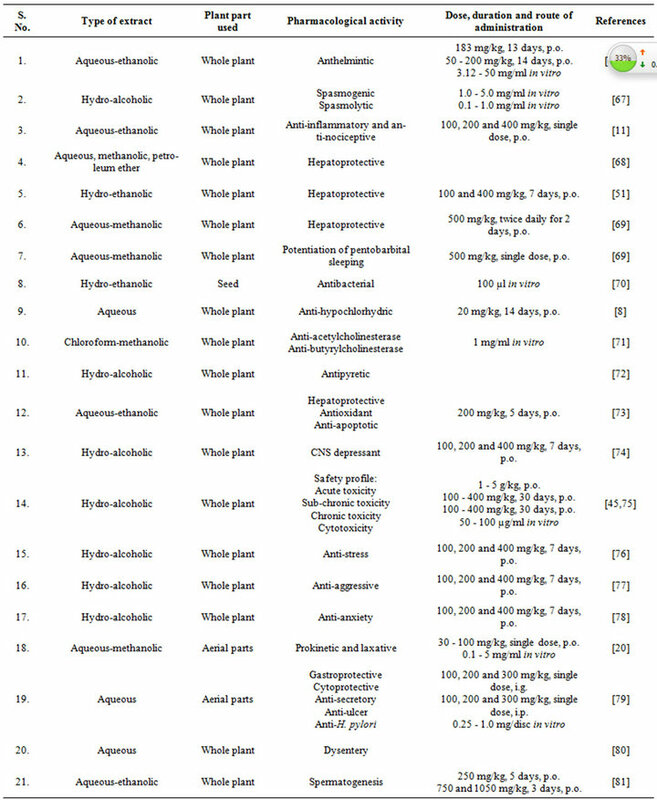 Diverse reported pharmacological properties of such secondary metabolites of Fumaria indica are summarized in Table 4 [47-64]. The doses and routes of administrations used in these studies are also mentioned in this table. Other reports on therapeutically interesting pharmacological properties of different types of extracts obtained from the whole plant or from its areal parts and seeds have appeared also. 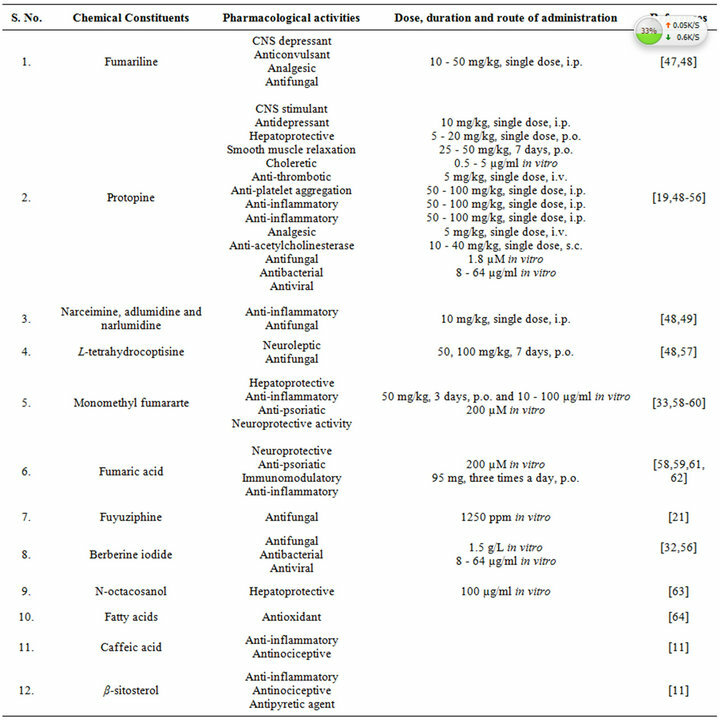 Table 5 [65-81] gives an overview of these reports which also includes the type of extracts and their doses used in the study. More detailed or critical analysis of available information on bioactivities and safety of Fumaria indica extracts and their bioactive constituents is beyond the scope of this communication. For such purposes a recent review  and several monographs now available on the plant can be consulted. Table 3. Marketed formulations containing Fumaria indica extracts. Table 4. 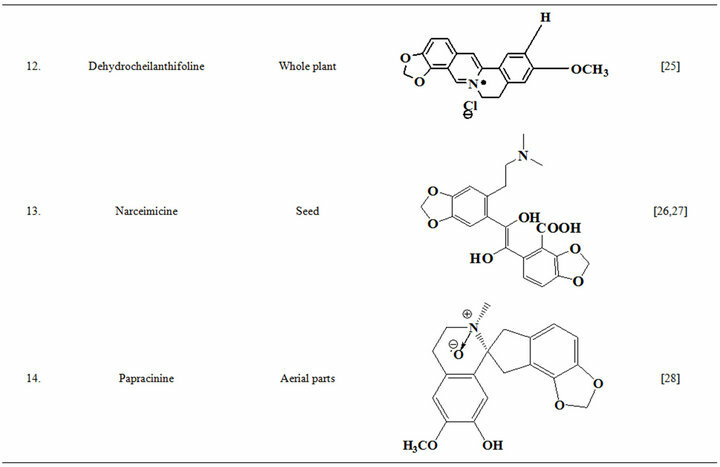 Reported pharmacological activities of secondary plant metabolites isolated from Fumaria indica. isolated from opium during 1875, and since then it has been detected in numerous other medicinal plants, including several of them commonly used in TCM (Table 6 [82-120]). During more recent decades diverse therapeutically interesting pharmacological properties of protopine have been identified, and many analogous activities have also been reported for extracts of diverse other protopine producing plants. One such report dealing with antidepressant like properties of the alkaloid revealed that it is a potent inhibitor of neuronal serotonin and noradrenaline transporter, and does not have any effects on dopamine or GABA transporters . Despite extensive efforts though, no antidepressant like activity of a hydro alcoholic Fumaria indica extract could be detected in rodent behavioural models commonly used for detecting such activities of synaptic serotonin and noradrenaline reuptake inhibitors . Since protopine content of the tested extract is not known, no definitive statements on the role of protopine in psychotherapeutic potentially of Fumaria indica extracts can yet be made. Table 5. 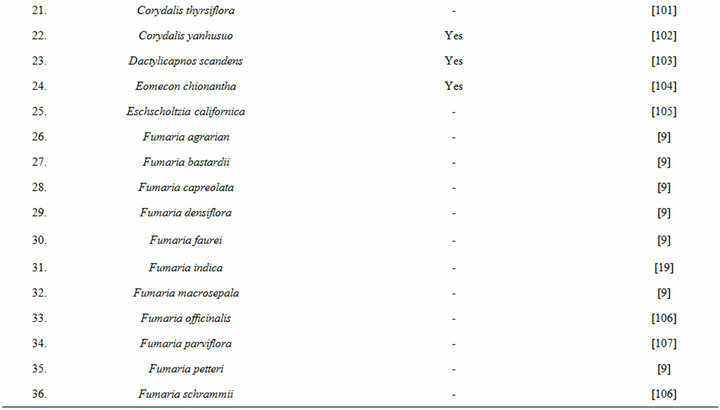 Reported pharmacological activities of Fumaria indica extracts. Table 6. 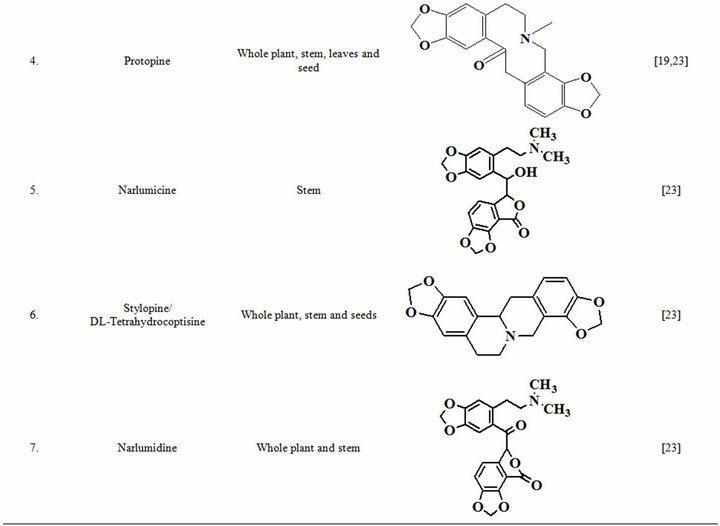 Some plants known to contain protopine and other Fumaria alkaloids. hydro alcoholic Fumaria indica extract were detectable in non-stressed animals , such effects of the same extract was apparent in the same tests using mentally stressed animals . It must be mentioned also that anxiolytics like and diverse other psychopharmacological activities of Fumaria indica extracts can be observed after their repeated daily doses only, and that their efficacies increase with the number of their daily oral doses administered. These and many other observations made to date with diverse types of Fumaria indica extracts and their bioactive constituents clearly reveal that their pharmacological targets and modes of actions are not like those of any known psychoactive drugs and other bioactive agents studied to date. It was only by the use of appropriate holistic psychopharmacological strategy, and proper choices of plant materials and extraction procedures, that these conclusions could be reached with certainty. It cannot be overemphasized that like many other medicinal plants Fumaria indica also produces structurally and functionally diverse bioactive secondary plant metabolites, not all of which can be extracted by a single solvent or extraction procedure. Moreover, therapeutically interesting bio-activity profile of a given plant extract is not only a resultant of the combined effects of all bioactive ingredients present in it, but also depends on its treatment regimen used to define its activity profile. Complexities arising from these facts clearly indicate that translation of traditional knowledge on medicinal uses of Fumaria indica, or of any other medicinal plant, in terms of modern medical sciences is possible only when the plant is considered as a whole, and its diverse types of extracts are tested in a battery of therapy relevant animal models. Hereupon, due attention has to be paid to the psychopharmacological activity profiles of the extracts. It is now well established that all chronic diseases, or illnesses, always causes mental health problems, and that bi-directional interactions between mental health problems and physical health is a common feature of almost all socioeconomically important health problems. Unfortunately, even today, modern medicinal phyto-chemists and pharmacologists pay little attention to these facts and continue to explore traditionally known medicinal plants as sources for structurally and functionally novel therapeutic lead molecules only. Lessons learned and experiences gained from extensive efforts made since decades in our laboratories and elsewhere strongly suggest that Fumaria indica could be a valuable tool for identifying novel pharmacological targets and mechanisms potentially useful for achieving better and reproducible successes with phyto-pharmaceuticals containing its extracts as active ingredients. Since Fumaria indica is a weed, and holistic pharmacological strategies can easily be practiced in many developing and underdeveloped countries, efforts to better understand and more precisely define its therapeutic potentials can be strongly recommended. Moreover, since the lists of plants producing the same or structurally analogous bioactive secondary metabolites of Fumaria indica are long (for example see Table 6)know how gained from the efforts to properly decode its pharmacology will certainly be useful for decoding medicinal values of many other as yet underexplored ones. In any case, experiences gained with Fumaria indica strongly suggest that repeated oral dose studies with psychoactive alkaloid containing plants could be the more appropriate ones for properly evaluating their psychotherapeutic potentials. W. C. McClatchey, G. B. Mahady, B. C. Bennett, L. Shiels and V. Savo, “Ethnobotany as a Pharmacological Eesearch Tool and Recent Developments in CNS-Active Natural Products from Ethnobotanical Sources,” Pharmacology and Therapeutics, Vol. 123, No. 2, 2009, pp. 239-254. P. V. Sharma, “Charak Samhita,” Chaukhambha Orientalia, Varanasi, 1983. P. V. Sharma and G. P. Sharma, “Dhanvantari Nighantu,” Chaukhambha Orientalia, Varanasi, 2008. B. Mishra and R. Vaishya, “Bhava Prakasha,” Chaukhamba Sanskrit Bhawan, Varanasi, 2003. S. R. Baquar, “Medicinal and Poisonous Plants of Pakistan,” Printas, Karachi, 1989. U. Mandal, D. K. Nandi, K. Chatterjee, K. M. Ali, A. Biswas and D. Ghosh, “Effect of Different Solvent Extracts of Fumaria vaillantii L. on Experimental Hypochlorhydria in Rat,” Asian Journal of Pharmaceutical and Clinical Research, Vol. 4, No. 1, 2011, pp. 136-141. 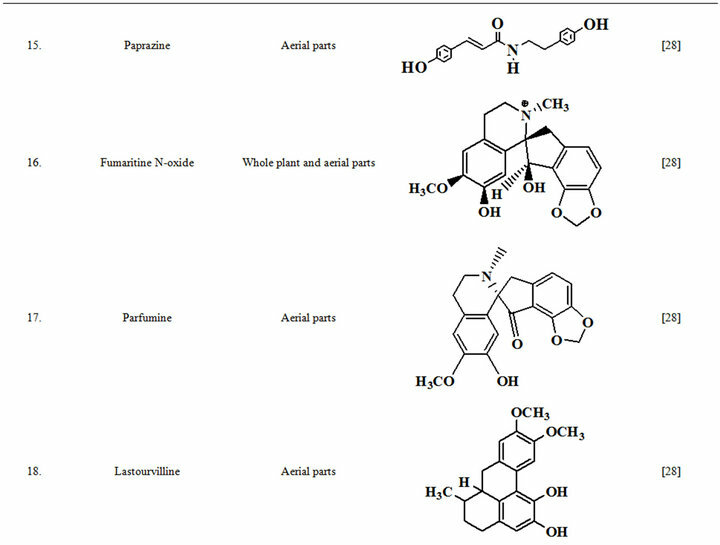 R. Suau, B. Cabezudo, R. Rico, F. Najera and J. M. Loppez-Romero, “Direct Determination of Alkaloid Contents in Fumaria Species by GC-MS,” Phytochemical Analysis, Vol. 13, No. 6, 2011, pp. 363-367. W. Murad, A. Ahmad, S. A. Gilani and M. A. Khan, “Indigenous Knowledge and Folk Use of Medicinal Plants by the Tribal Communities of Hazar Nao Forest, Malakand District, North Pakistan,” Journal of Medicinal Plants Research, Vol. 5, No. 7, 2011, pp. 1072-1086. C. V. Rao, A. R. Verma, P. K. Gupta and M. V. Kumar, “Anti-Inflammatory and Anti-Nociceptive Activities of Fumaria indica Whole Plant Extract in Experimental Animals,” Acta Pharmaceutica, Vol. 57, No. 4, 2007, pp. 491-498. F. E. Araii, M. Keshavarzi, M. Sheidaii and P. Ghadam, “Fruit and Seed Morphology of the Fumaria L. Species (Papaveraceae) of Iran,” Turkish Journal of Botany, Vol. 35, No. 2, 2011, pp. 167-173. P. C. Gupta, N. Sharma and C. V. Rao, “A Review on Ethnobotany, Phytochemistry and Pharmacology of Fumaria indica (Fumitory),” Asian Pacific Journal of Tropical Biomedicine, Vol. 2, No. 8, 2012, pp. 665-669. Anonymous, “The Ayurvedic Pharmacopoeia of India,” Government of India Ministry of Health and Family Welfare Department of Ayush, Controller of Publications, New Delhi, 1999. A. A. Rajopadhya and A. S. Upadhye, “Botanical and Phytochemical Standardization of Fumaria vaillantii,” Indian Journal of Natural Products and Resources, Vol. 2, No. 3, 2011, pp. 369-374. R. N. Chopra, S. L. Nayar and S. N. Chopra, “Glossary of Indian Medicinal Plants,” National Institute of Science Communication and Information Resources (CSIR), New Delhi 1985. K. R. Kirtikar and B. D. Basu, “Indian Medicinal Plants,” Lait Mohan Basu Publishers, Allahabad, 1985. K. M. Nadkarni, “Indina Materica Medica,” Popular Prakashan, Bombay, 1976. V. B. Pandey, B. Dasgupta, S. K. Bhattacharya, R. Lal and P. K. Das, “Chemistry and Pharmacology of the Major Alkaloid of Fumaria indica,” Current Science, Vol. 40, No. 17, 1971, pp. 455-457. A. U. Rahman, M. K. Bhatti and M. I. Choudhary, “Chemical Constituent of Fumaria indica,” Fitoterapia, Vol. 63, No. 2, 1992, pp. 129-135. A. U. Rahman, S. S. Ali, M. M. Qureshi, S. Hasan and M. K. Bhatti, “Fumarizine—A New Benzylisoquinoline Alkaloid from Fumaria indica,” Fitoterapia, Vol. 60, No. 6, 1989, pp. 552-553. Y. C. Tripathi, M. Rathore and H. Kumar, “On the Variation of Alkaloidal Contents of Fumaria indica at Different Stages of Life Span,” Ancient Science of Life, Vol. 13, No. 3-4, 1993, pp. 271-273. L. D. Kapoor, “Handbook of Ayurvedic Medicinal Plants,” CRC Press, Boca Raton, 1990. K. Usmanghani, A. Saeed and M. T. Alam, “Indusyunic Medicine,” University of Karachi Press, Karachi, 1997. I. U. Haq and M. Hussain, “Medicinal Plants of Mansehra,” Hamdard Medicus, Vol. 36, No. 3, 1993, pp. 78-79. P. K. Singh, V. Kumar, R. K. Tiwari, A. Sharma, C. V. Rao and R. H. Singh, “Medico-Ethnobotany of ‘Chatara’ Block of District Sonebhadra, Uttar Pradesh, India,” Advances in Biological Research, Vol. 4, No. 1, 2010, pp. 65-80. S. Z. Husain, R. N. Malik, M. Javaid and S. Bibi, “Ethonobotanical Properties and Uses of Medicinal Plants of Morgah Biodiversity Park, Rawalpindi,” Pakistan Journal of Botany, Vol. 40, No. 5, 2008, pp. 1897-1911. R. Qureshi, A. Waheed, M. Arshad and T. Umbreen, “Medico-Ethnobotanical Inventory of Tehsil Chakwal, Pakistan,” Pakistan Journal of Botany, Vol. 41, No. 2, 2009, pp. 529-538. M. Ahmad, R. Qureshi, M. Arshad, M. A. Khan and M. Zafar, “Traditional Herbal Remedies Used for the Treatment of Diabetes from District Attock (Pakistan),” Pakistan Journal of Botany, Vol. 41, No. 6, 2009, pp. 2777- 2782. G. K. Singh and V. Kumar, “Acute and Sub-Chronic Toxicity Study of Standardized Extract of Fumaria indica in Rodents,” Journal of Ethnopharmacology, Vol. 134, No. 3, 2011, pp. 992-995. A. Jamal, A. Siddiqi and S. M. Ali, “Home Remedies for Skin Care in Unani System of Medicine,” Natural Product Radiance, Vol. 4, No. 4, 2005, pp. 339-340. A. Kumar, V. B. Pandey, K. K. Seth, B. Dasgupta and S. K. Bhattacharya, “Pharmacological Actions of Fumariline Isolated from Fumaria indica Seeds,” Planta Medica, Vol. 52, No. 4, 1986, pp. 324-325. R. A. Singh, U. P. Singh, V. K. Tripathi, R. Roy and V. B. Pandey, “Effect of Fumaria indica Alkaloids on Conidial Germination of Some Fungi,” Oriental Journal of Chemistry, Vol. 13, No. 2, 1997, pp. 177-180. Y. C. Tripathi and R. K. Dwivedi, “Central Nervous System and Anti-Infammatory Activities of Alkaloid of Fumaria indica,” Natural Academy Science Letters, Vol. 13, No. 6, 1990, pp. 231-233. L. F. Xu, W. J. Chu, X. Y. Qing, S. Li, X. S. Wang, G. W. Qing, J. Fei and L. H. Guo, “Protopine Inhibits Serotonin Transporter and Noradrenaline Transporter and Has the Antidepressant-Like Effect in Mice Models,” Neuropharmacology, Vol. 50, No. 8, 2006, pp. 934-940. A. Rathi, A. K. Srivastava, A. Shirwaikar, A. K. S. Rawat and S. Mehrotra, “Hepatoprotective Potential of Fumaria indica Pugsley Whole Plant Extracts, Fractions and an Isolated Alkaloid Protopine,” Phytomedicine, Vol. 15, No. 6-7, 2008, pp. 470-477. Y. H. Huang, Z. Z. Zhang and J. X. Jiang, “Relaxant Effects of Protopine on Smooth Muscles,” Zhongguo Yao Li Xue Bao, Vol. 12, No. 1, 1991, pp. 16-19. Q. Xu, R. L. Jin and Y. Y. Wu, “Opioid, Calcium, and Adrenergic Receptor Involvement in Protopine Analgesia,” Acta Pharmaceutica Sinica, Vol. 14, No. 6, 1993, pp. 495-500. B. Sener and I. Orphan, “Molecular Diversity in the Bioactive Compounds from Turkish Plants—Evaluation of Acetylcholinesterase Inhibitory Activity of Fumaria Species,” Journal of the Chemical Society of Pakistan, Vol. 26, No. 3, 2004, pp. 313-315. I. Orhan, B. Ozçelik, T. Karaoglu and B. Sener, “Antiviral and Antimicrobial Profiles of Selected Isoquinoline Alkaloids from Fumaria and Corydalis Species,” Zeitschrift für Naturforschung C, Vol. 62, No. 1-2, 2007, pp. 19- 26. V. K. Tripathi and V. B. Pandey, “Stem Alkaloids of Fumaria indica and Their Biological Activity,” Planta Medica, Vol. 58, No. S7, 1992, pp. 651-652. R. De Jong, A. C. Bezemer, T. P. Zomerdijk, P. K. T. Vande, T. H. Ottenhoff and P. H. Nibbering, “Selective Stimulation of T Helper 2 Cytokine Responses by the Anti-Psoriasis Agent Monomethyl Fumarate,” European Journal of Immunology, Vol. 26, No. 9, 1996, pp. 2067- 2074. M. Lukashev, W. Zeng, S. Goelz, R. Linker and R. Gold, “Activation of Nrf2 and Modulation of Disease Progression in EAE Models by BG00012 (Dimethyl fumarate) Suggests a Novel Mechanism of Action Combining Antiinflammatory and Neuroprotective M. S. Modalities,” Multiple Sclerosis, Vol. 13, No. S2, 2007, p. S149. U. Mrowietz and K. Asadullah, “Dimethyl fumarate for Psoriasis: More than a Dietary Curiosity,” Trends in Molecular Biology, Vol. 11, No. 1, 2007, pp. 43-48. S. Schilling, S. Goelz, R. Linker, F. Luehder and R. Gold, “Fumaric Acid Esters Are Effective in Chronic Experimental Autoimmune Encephalomyelitis and Suppress Macrophage Infiltration,” Clinical and Experimental Immunology, Vol. 145, No. 1, 2006, pp. 101-107. 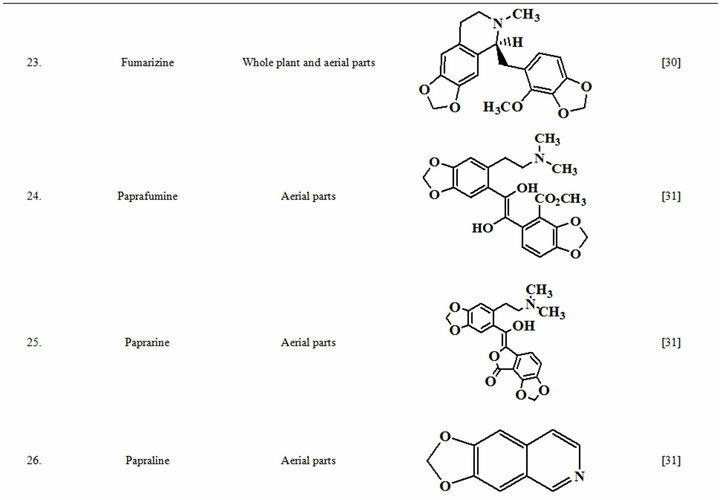 F. H. Tirtash, M. Keshavarzi and F. Fazeli, “Antioxidant Components of Fumaria Species (Papaveraceae),” World Academy of Science, Engineering and Technology, Vol. 50, No. 2, 2011, pp. 233-236. P. Hordegen, H. Hertzberg, J. Heilmann, W. Langhans and V. Maurer, “The Anthelmintic Efficacy of Five Plant Products against Gastrointestinaltrichostrongylids in Artificially Infected Lambs,” Veterin Parasitology, Vol. 117, No. 1-2, 2003, pp. 51-60. I. R. M. Al-Shaibani, M. S. Phulan and M. Shiekh, “Anthelmintic Activity of Fumaria parviflora (Fumariaceae) against Gastrointestinal Nematodes of Sheep,” International Journal of Agriculture and Biology, Vol. 11, No. 4, 2009, pp. 431-436. S. R. Kurma and S. H. Mishra, “Hepatoprotective Activity of the Whole Plant of Fumaria indica,” Indian Journal of Pharmaceutical Sciences, Vol. 59, No. 4, 1997, pp. 165-170. J. Parekh and S. Chanda, “In Vitro Screening of Antibacterial Activity of Aqueous and Alcoholic Extracts of Various Indian Plant Species against Selected Pathogens from Enterobacteriaceae,” African Journal of Microbiology Research, Vol. 1, No. 6, 2007, pp. 92-99. G. K. Singh and V. Kumar, “Neuropharmacological Screening and Lack of Antidepressant Activity of Standardized Extract of Fumaria indica: A Preclinical Study,” Electronic Journal of Pharmacology and Therapy, Vol. 3, No. 5, 2010, pp. 19-28. G. K. Singh, G. Rai, S. S. Chatterjee and V. Kumar, “Beneficial Effects of Fumaria indica on Chronic Stress-Induced Neurobehavioral and Biochemical Perturbations in Rats,” Chinese Medicine, Vol. 3, No. 1, 2012, pp. 49-60. G. K. Singh, G. Rai, S. S. Chatterjee and V. Kumar, “Potential Antianxiety Activity of Fumaria indica: A Preclinical Study,” Pharmacognosy Magazine, 2012. Rifat-uz-Zaman and Attiq-ur-Rehman, “Anti-Helicobacter pylori and Protective Effects of Aqueous Fumaria vaillantii L. Extract in Pylorus-Ligated, Indomethacinand Toxic-Induced Ulcers in Rats,” African Journal of Pharmacy and Pharmacology, Vol. 4, No. 5, 2010, pp. 256-262. S. Mitra and S. K. Mukherjee, “Ethnomedicinal Usages of Some Wild Plants of North Bengal Plain for GastroIntestinal Problems,” Indian Journal of Traditional Knowledge, Vol. 9, No. 4, 2010, pp. 705-712. M. H. Nasrabadi, H. Aboutalebi and M. Naseri, “Effect of Fumaria parviflora Alcoholic Extract on Male Rat’s Reproductive System,” Journal of Medicinal Plants Research, Vol. 6, No. 10, 2012, pp. 2004-2010. Y. L. Tang, A. M. Yang, Y. S. Zhang and H. Q. Wang, “Studies on the Alkaloids from the Herb of Corydalis adunca,” Zhongguo Zhong Yao Za Zhi, Vol. 30, No. 3, 2005, pp. 195-197. L. Y. He and Y. B. Zhang, “TLC Separation and Densitometric Determination of Six Isoquinoline Alkaloids in Corydalis bungeana,” Yao Xue Xue Bao, Vol. 20, No. 5, 1985, pp. 377-382. P. Wangchuk, P. A. Keller, S. G. Pyne, T. Sastraruji, M. Taweechotipatr, R. Rattanajak, A. Tonsomboon and S. Kamchonwongpaisan, “Phytochemical and Biological Activity Studies of the Bhutanese Medicinal Plant Corydalis crispa,” Natural Product Communication, Vol. 7, No. 5, 2012, pp. 575-580. Y. Shen, C. Han, B. Xia, Y. Zhou, C. Liu and A. Liu, “Determination of Four Alkaloids in Corydalis decumbens by HPLC,” Zhongguo Zhong Yao Za Zhi, Vol. 36, No. 15, 2011, pp. 2110-2112. X. Jiang, J. Ye, J. Zeng, X. Zou and J. Wu, “Determination of Protopine in Corydalis racemose by HPLC,” Zhongguo Zhong Yao Za Zhi, Vol. 35, No. 17, 2010, pp. 2315-2317. Y. W. Li and Q. C. Fang, “Isoquinoline Alkaloids from Corydalis thyrsiflora Prain,” Yao Xue Xue Bao, Vol. 26, No. 4, 1991, pp. 303-306. Z. Lu, W. Sun, X. Duan, Z. Yang, Y. Liu and P. Tu, “Chemical Constituents from Corydalis yanhusuo,” Zhongguo Zhong Yao Za Zhi, Vol. 37, No. 2, 2012, pp. 235-237. F. Du, S. Wang and Z. Xie, “Concentration of Four Alkaloids in the Aerial Parts of Eomecon chionantha from Different Month in Year,” Zhong Yao Cai, Vol. 23, No. 4, 2000, pp. 189-190. 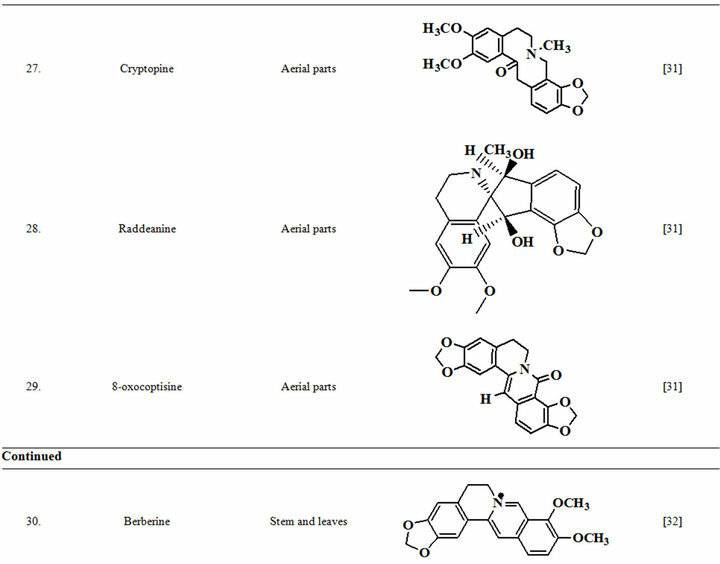 A. Shafiee, I. Lalezari and O. Rahimi, “Alkaloids of Papaver Genus IX. 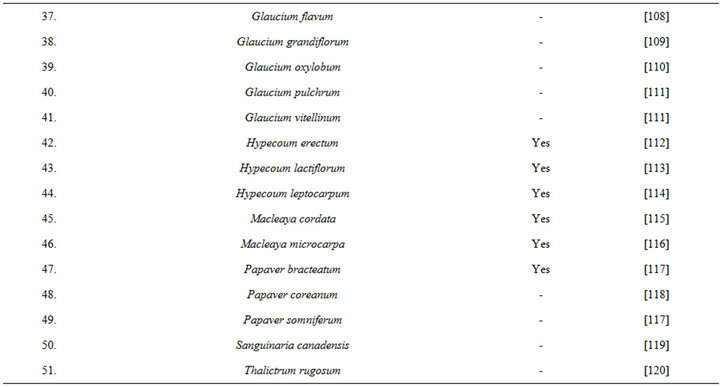 Alkaloids of Glaucium vitellinum Boiss and Buhse, Population Seerjan and Glaucium pulchrum Stapf, Population Elika,” Lloydia, Vol. 40, No. 4, 1977, pp. 352-355. D. S. Bae, Y. H. Kim, C. H. Pan, C. W. Nho, J. Samdan, J. Yansan and J. K. Lee, “Protopine Reduces the Inflammatory Activity of Lipopolysaccharide-Stimulated Murine Macrophages,” Journal of Biochemistry and Molecular Biology, Vol. 45, No. 2, 2012, pp. 108-113. B. Z. Chen and Q. C. Fang, “Chemical Study on a Traditional Tibetan Drug Hypecoum leptocarpum,” Yao Xue Xue Bao, Vol. 20, No. 9, 1985, pp. 658-661. P. G. Vincent and B. F. Engelke, “High Pressure Liquid Chromatographic Determination of the Five Major Alkaloids in Papaver somniferum L. and Thebaine in Papaver bracteatum Lindl. Capsular Tissue,” Journal-Association of Official Analytical Chemists, Vol. 62, No. 2, 1979, pp. 310-314. 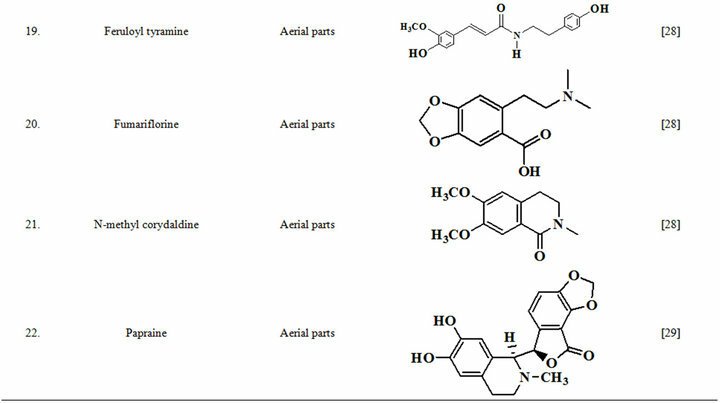 D. U. Lee, J. H. Park, L. Wessjohann and J. Schmidt, “Alkaloids from Papaver coreanum,” Natural Product Communication, Vol. 6, No. 11, 2011, pp. 1593-1594. W. N. Wu, J. L. Beal, G. W. Clark and L. A. Mitscher, “Antimicrobial Agents from Higher Plants. 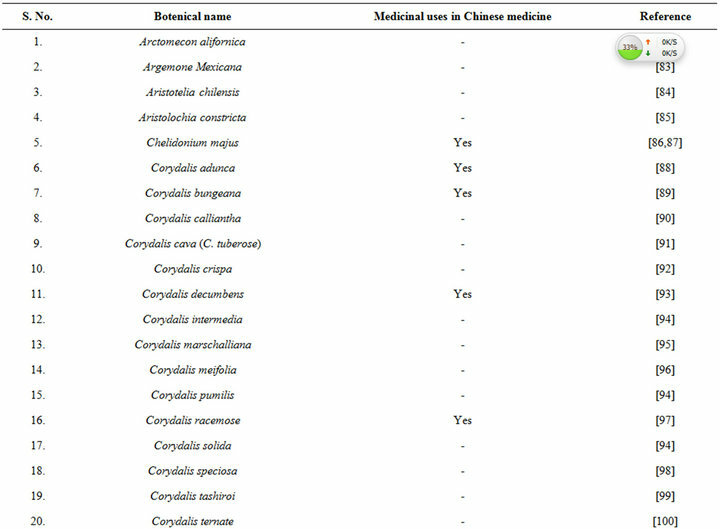 Additional Alkaloids and Antimicrobial Agents from Thalictrum rugosum,” Lloydia, Vol. 39, No. 1, 1976, pp. 65-75. *Former Head of the Pharmacological Research Laboratories, Dr. Willmar Schwabe GmbH & Co. KG, Karlsruhe, Germany.